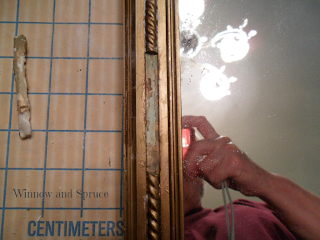 Faced with a damaged mirror that I couldn't sell and didn't need at home I was about to place it on the curb when I remembered a blurb in a magazine many years ago about making a plaster mold to repair a French gilt bench. A search of the internet showed me several possibilities. Combining what I'd read from a number of sources I set out to give it a try. After all, I had nothing to lose at this point. A trip to Michael's had me standing in front of the clay aisle reading and re-reading every package. I decided to use the kind you baked, although I had no plans to bake it. I bought Dap plaster of paris from Home Depot. A huge container. The only size they had in my local HD. Enough to last me several years, I'm sure. I worked some of the clay in my hands to soften it, brushed a little baby powder on the frame, and pushed the clay onto the frame just above the repair site so I had a replica of the rope trim as well as the depth of the space. 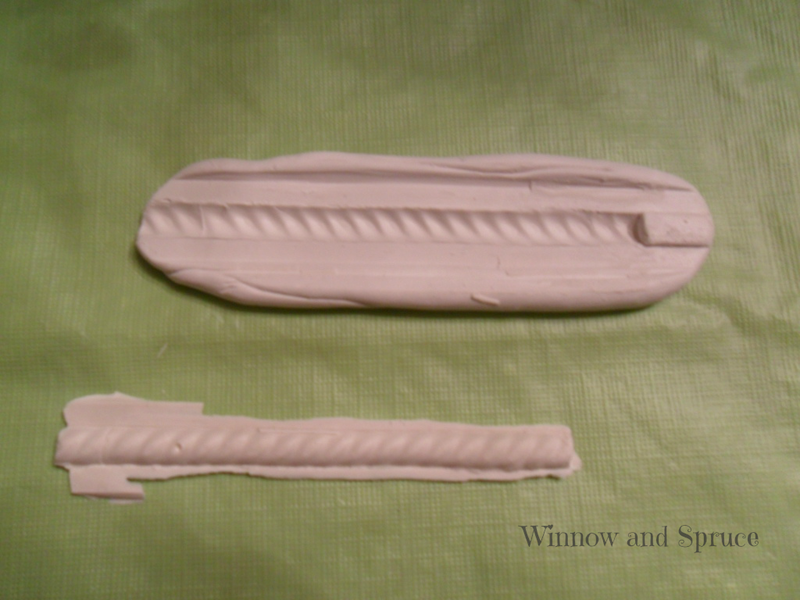 When I removed it I had a perfect indentation for the mold. I mixed a small amount of plaster following the directions on the container. I brushed a little more baby powder into the mold and filled it with plaster. 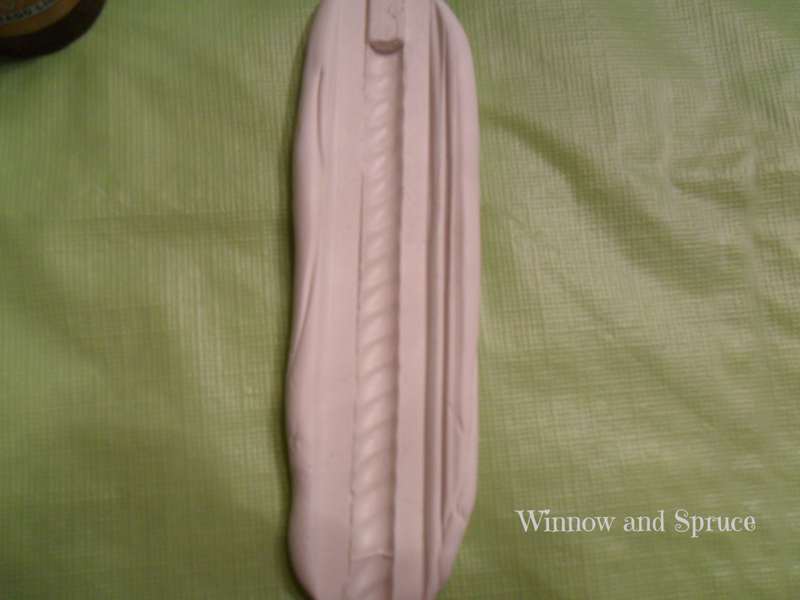 When it hardened I gently peeled the clay away. 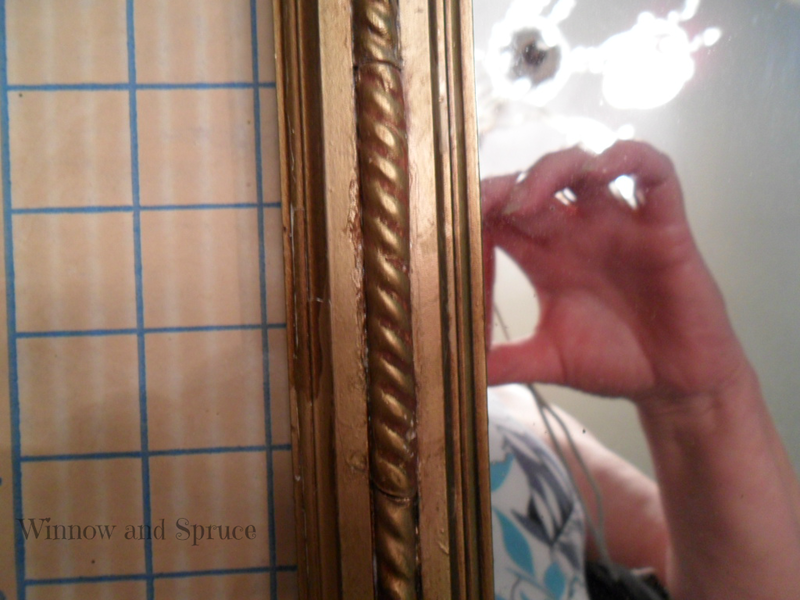 Fitting the plaster piece to the hole in the frame I trimmed it down using nail scissors, cuticle clippers, nail file and emery board to the size and pattern I needed. I glued it in place with E6000 glue. After it dried I painted the new piece to match the frame with Liquid Gold and both brown and black acrylic craft paint for aging. I made a few improvements after these pics were taken, filling in the spaces where the new trim and the old trim joined, cleaned around the site and touched up the painting. I didn't take a before and after. Sharing this on a blog was the farthest thing from my mind. I admit, though, I was pretty proud of myself. 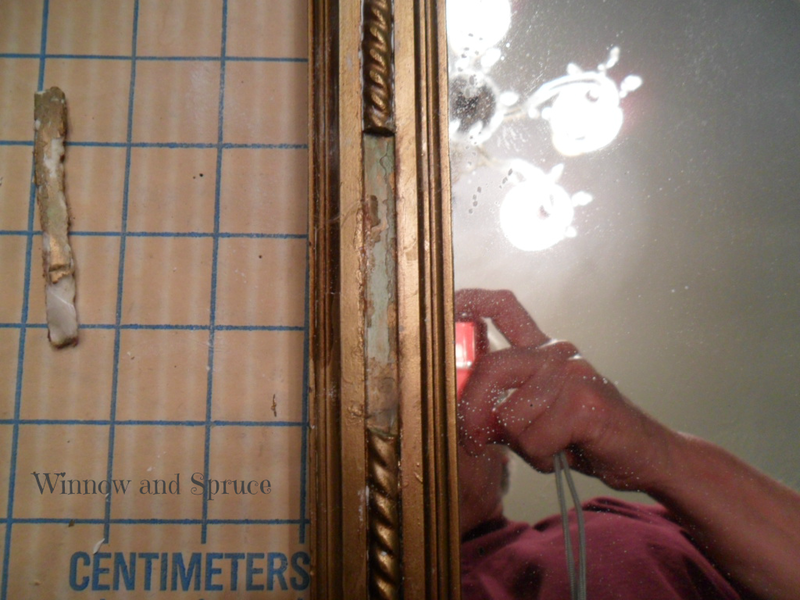 I not only repaired the mirror but, most importantly, realized how much I enjoyed doing it. I've always said I had the patience of Job. Nice to know I was right. Wow ... what a great tip! I have a mirror I'm going to try this on. BTW I found you through the Haven Conf link party. Can't wait! Thanks for stopping by, Robin. 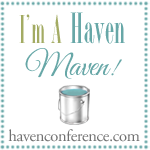 I'm heading over to visit you at TheDesigNest and look forward to meeting you at Haven. 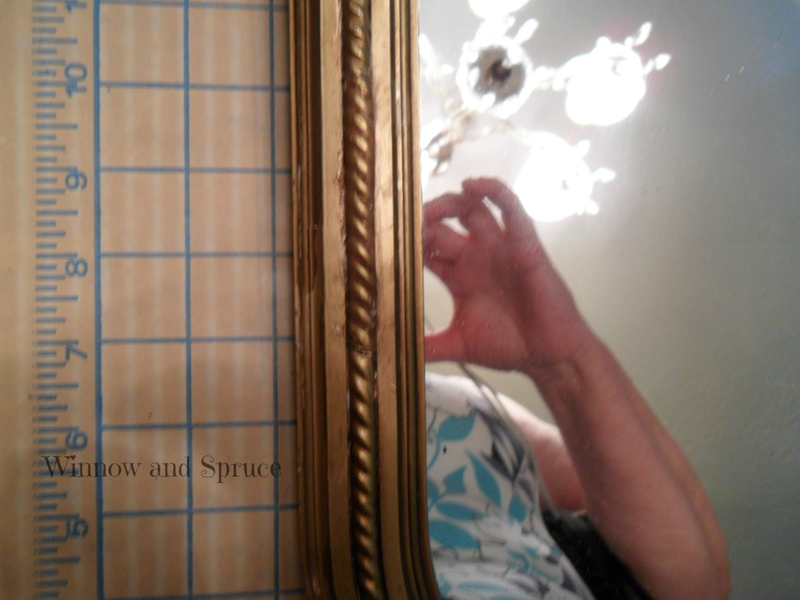 Let me know how your mirror turns out! Wow, this is amazing!! I would never have thought to try it... What a great idea. Thank you for publishing this! I have been foiled many times by customs agents while trying to sneak a can of "Durham's Rock Hard Water Putty" into Canada from the US to do just such a repair on a huge Victorian sideboard. Though I do not relish the idea of filing plaster to fit in small places, I am really glad to hear of an alternative! I've never tried the Durham's but will definitely check it out. I'd love to see your sideboard when you finish it if you don't mind sharing. Thanks so much for visiting, and I hope you will again.. Excellent tutorial. I can try this fixing technique.